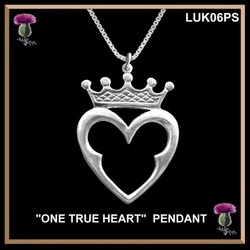 This elegant sterling silver "True Heart" Luckenbooth pendant is a simple and "clean" design. 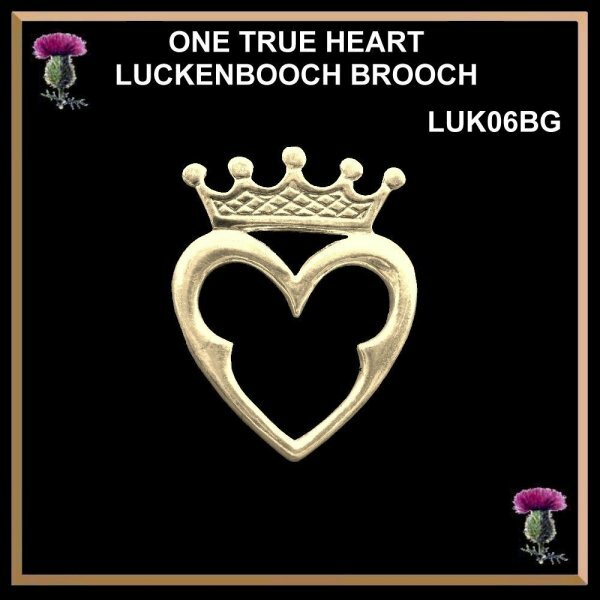 This design features some of the traditional Luckenbooth motifs, but here we have a single heart...one "True Heart" representing the dedication of one's heart to that special other. This heart is surmounted by a crown representing loyalty to Scotland and Scotland's crown. The other interpretation of the single heart is that the wearer is still searching for that other heart to interlock with theirs ! 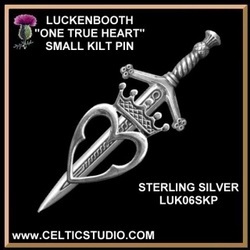 This beautiful traditional design is the perfect way to display your Scottish heritage, your love and also protect those you love from evil spirits and witches! This "True Heart" Luckenbooth is a perfect lasting love token. This beautiful traditional sterling silver pendant measures 1-1/4" long (32mm) by 7/8" wide (24 mm) and includes an 18" chain. This beautiful traditional gold pendant measures 1-1/4" long (32mm) by 7/8" wide (24 mm). The gold chain is extra. This beautiful traditional sterling silver brooch measures 1-1/4" long (32mm) by 7/8" wide (24 mm) and includes an 18" chain. This beautiful traditional gold brooch measures 1-1/4" long (32mm) by 7/8" wide (24 mm). 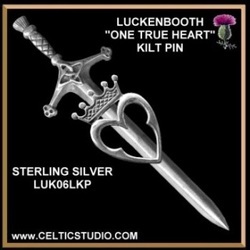 This antique design Luckenbooth is hand made in sterling silver with a secure high quality pin back. The Luckenbooth design in the middle is 3/4 “ (20mm) wide and 1” (26mm) high. The overall length is 3 7/8” (99mm) and is 1 5/16” (34mm) across the handle of the sword. This beautiful traditional sterling silver brooch measures 1-1/4" long (32mm) by 7/8" wide (24 mm) .